Positioned at the corner of Main and High Streets, the Conventus site is a natural Northern Gateway to the Buffalo Niagara Medical Center. Viewing the site plan for Conventus reveals the true sense of collaboration and forward thinking that has gone into creating this world-class medical space in Buffalo New York. The 350,000 square foot building reaches a height of 7 floors and boasts + 50,000 square foot floor plates. Visitors and tenants of the building will enjoy 2 floors of underground parking beneath the building as well as retail amenities on the first floor, and a covered patient drop-off area located on High Street. 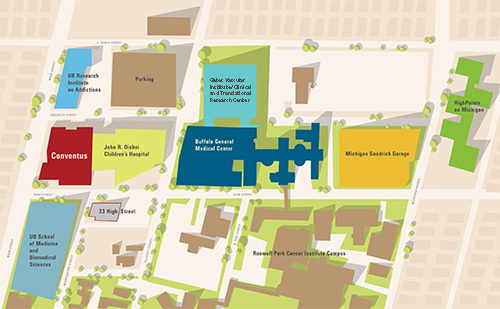 The site is also convenient to the Metro Rail transit system, the access for which will be located within the Medical School just across High Street. The connections that were created while planning this unique medical space reveal the true character of the project and have helped Ciminelli create a world-class facility in Buffalo New York. Anchor institutions on the Buffalo Niagara Medical Campus (BNMC) will enjoy physical, coatless connections to Conventus ensuring not only the flow of people, but also of ideas and the spirit of collaboration that medicine is built on.